Joy Nagal will tell you she’s a late bloomer when it comes to running. But boy did she blossom. 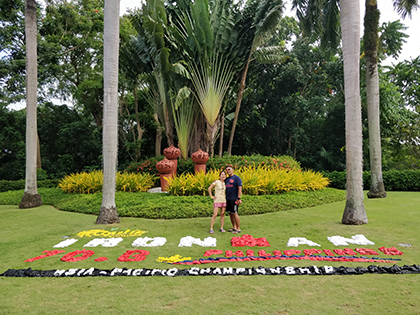 Fresh off an international Half-Ironman – that’s a 70.3-mile distance triathlon comprised of a 1.2-mile swim, a 56-mile bike ride, and a 13.1-mile run (half marathon) - the legal secretary with County Counsel has added the huge accomplishment to her long list of brutal and intense races. And running. And running. And running. The Philippine-born racer got the itch after her friends invited her to the Silver Strand Half Marathon in Coronado back in 2009. She only did the 5K, but those three miles are all it took to get her hooked. She graduated to a 10K the next year and a couple weeks after that she braved the Carlsbad Half Marathon. 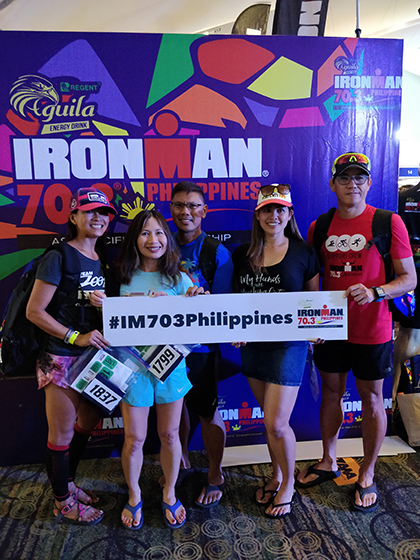 Nagal and her husband in the Phillippines for the Ironman 70.3 in Cebu. So she did. She signed up for four more marathons that year and even became a member of a national running club in which she had to complete three half marathons in 90 days to qualify for membership. And finally, in 2010, she found a local running group in her community to be a part of. The local group had structured and regular trainings, which helped Nagal become a better runner. Her times started improving, and the group provided inspiration and motivation to place in races. She says the improvement didn’t happen overnight – in fact, it took years for her to shave significant time off her races. But it’s those small goals that keep Nagal going. Nagal and her husband in the Phillippines. Perhaps one of Nagal’s biggest running influences is her husband, Josef, whom she met in 2011 at the Carlsbad Marathon and was also part of the national running club Nagal joined. 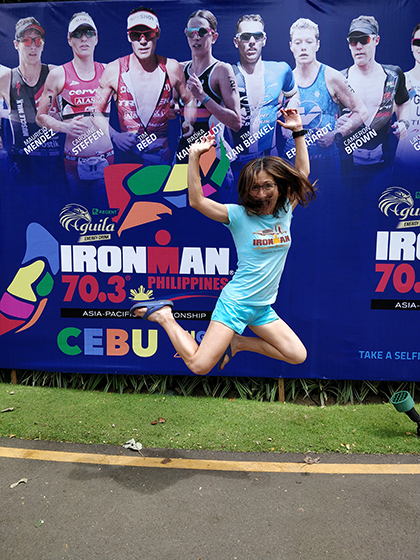 Sef, as Nagal affectionately refers to him, is the reason behind her audacious Ironman goals. He’d been training for his first full Ironman when they met in 2011 and Nagal had been intrigued in doing a duathon, which excludes a swimming portion. “He knew I had the desire, so he introduced me to the Triathlon Club of San Diego and took me to their beginner open water swims in Bonita Cove. I couldn’t swim from buoy to buoy; I would panic and hyperventilate,” she said. But Nagal got stronger in the water and has since completed an Ironman and a few half-Ironmans, including one in the Philippines this August – a trip she referred to as a “racecation” because she and her husband both flew out to their home country to compete in the grueling competition and then enjoy some time alone on a belated honeymoon. Nagal and Sef enjoyed sightseeing after their big race. The now-veteran racer and her husband were instrumental in establishing a local chapter of the Fil-Am Tri Club, San Diego region in 2012 (Filipino-American Triathlon Club), which originated in New Jersey. They’re still active and involved in the group and hope to run many more races together in the years to come, including more in their home country. For now, Nagal’s short-term goal is to re-qualify for the Boston Marathon (yup, she ran that already in 2016) or to qualify for the Chicago Marathon. She will be participating in the NYC Marathon in November. The runner also said that she hopes her story of finding her extracurricular passion late in life might inspire other employees out there, noting that the County of San Diego is constantly promoting wellness.